If you haven’t had any reasons to delete your Facebook account yet, the social network is now giving you a viable reason to do that. The Cambridge Analytica scandal has made a lot of people think if they really want their personal data be available to Facebook. So, if you’re determined to abandon Facebook once and for all, we’ve put together a list of tips to do everything right. What To Do Before You Delete Facebook? If you don’t want your Facebook data vanish for good together with your user profile, you can copy all of it. Facebook data implies user’s old statuses, all the images uploaded to user’s account, but it can also imply the things one may not have known Facebook was collecting. For instance, political affiliations, associated IP addresses, and searches. Looks alarming? Yes, your Facebook profile has to go. How to Check Which Services You Logged In With Facebook? Most certainly, there is a dozen apps you’ve logged in using the "Log in with Facebook" feature at some point. Not all of these apps are harmless, so before you leave Facebook for good, it’s worth checking all those places in one spot. Click on the Apps tab to list all services having access to your account. Click "Logged in with Facebook" to locate the ones you need. Set up new logins for every service before leaving Facebook. 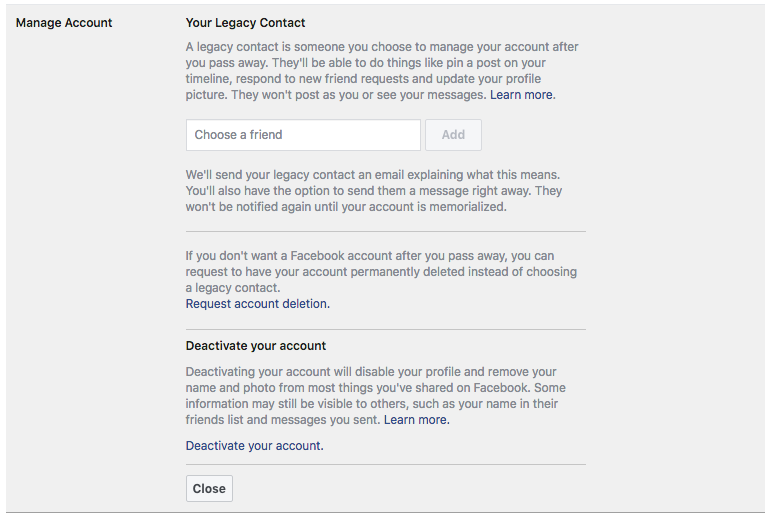 How to Delete, Not Deactivate Your Facebook Account? Facebook can be quite tricky when it comes to deleting your account. In fact, when you’re offered to deactivate a Facebook account, it’s not the same as deleting it. To deactivate your account, go to the Settings tab, in the General menu. Next, click the Edit button next to Manage Account. At this point, it is possible to deactivate your account. Deactivating the account gives you a chance to continue using the social network later, and keeps your profile visible to others. Facebook developers have a morbid sense of humor offering you to delete your user profile after death. But you don’t want to wait that long, right. Facebook keeps the right of a 90-day delay before it completely removes your user information from its database. In fact, there's still some material accessible by Facebook even after your user data is erased. However, the system says it's dissociated from personal identifiers. What The Heck is Ze: How & Why US Unis Use Non-Binary Pronouns?